With the current explosion of Blues around the world pop scene, singular instrumentalists such as Mayall and Clapton have become accepted as fine Blues musicians as opposed to just pop minions. It is interesting to look back to the birth of the British Blues when one man pioneered a sound that was to give incentive to every group of that time. The man was the late Cyril Davies. Robbed by an early death of the fruits of his labours, he and his group the 'All Stars' showed the path to many. 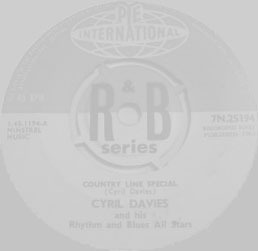 Cyril was the first man to emulate the sound of the Chicago Blues Band in England, with his harmonica electrified in the style of Little Walter he set a standard which helped many groups such as the Rolling Stones, The Yardbirds, and John Mayall's Bluesbreakers. Carlo Little-drums, Nicky Hopkins-piano, Cliff Barton-bass, with the addition of Jeff Beck on lead guitar who was not one of the original members. After Eric split from The Yardbirds and entered his historic partnership with John Mayall, it did not take long for him to earn the reputation of being Britain's number one exponent of the Blues guitar. These recordings were made around this time and as precious little exists of his ability on record between The Yardbirds and the first John Mayall and Eric Clapton albums, I thought it essential to make these tapes available to the serious collector to illustrate the transitional period which helped to build Eric's fantastic reputation." *The remaining four tracks on this classic LP, three by Santa Barbera Machine Head and one by Stuff Smith, are explained in the other accompanying liner notes by Gus Dudgeon.